There is a new look for the 2016 GMC Sierra, as it is “born from precision”. The new pickup will be arriving in showrooms across Canada this fall. 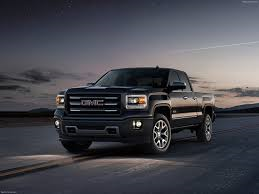 The engineers and designers at GM have given the new 2016 Sierra an even more distinctive look. With new exterior styling and new lighting technologies, the Sierra will be a standout next to any competitor on the road! On the inside, you will experience luxury and design at its finest, along with technologies that meet your every need! As you can see, this pickup is by far our most capable, comfortable and stylish truck yet. 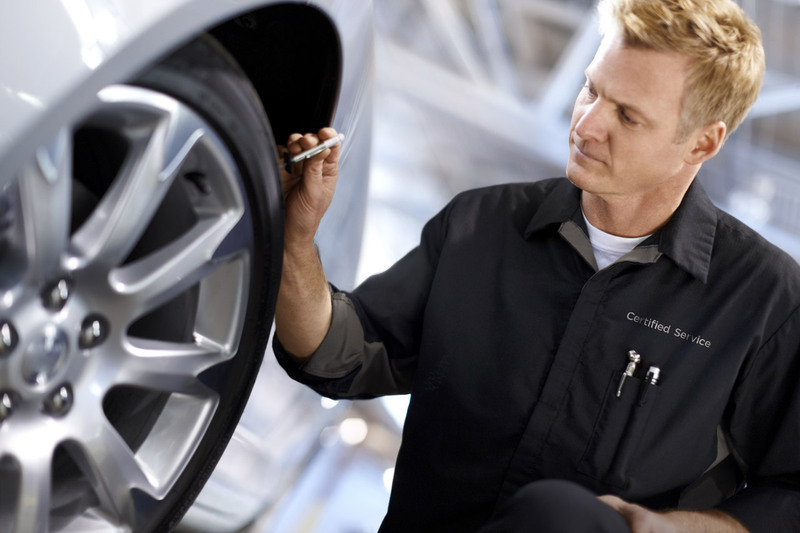 From maintenance to major repairs, the Certified Service experts and technicians at Queenston Chevrolet Buick GMC can take care of all your vehicle needs. Many people have the misconception that maintaining your vehicle at a dealership is more expensive than a local lube shop. We have shopped around, and when you compare apples to apples (same quality of oil, fluid, filter and multi-point inspection), our prices are very competitive for regular maintenance items. -GM certified technicians who know your GM vehicle inside and out. -Technicians who are equipped with state of the art diagnostic equipment, enabling quick and accurate diagnosis. -Service experts who know the maintenance schedule for your Chevrolet, Buick, and GMC, as well as Pontiac, Saturn, Hummer or Oldsmobile. -Service experts who recommend what service is required and when, according to your vehicle maintenance schedule, your environment and your personal driving habits. -A choice of certified parts to suit your budget and driving habits. -A comprehensive explanation of the services performed on your vehicle so that you can stay informed of your vehicle’s needs. Our Queenston on the Mountain location’s extensive renovations are almost complete. 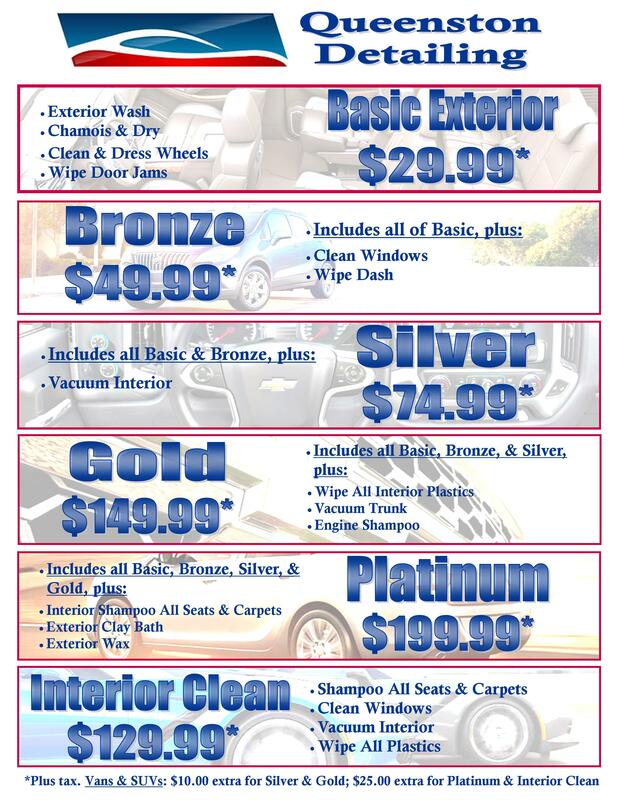 Our state-of-the-art car wash is now operational, and we offer a complimentary car wash with each service. We are in the process of updating our lounge, to provide a more comfortable, inviting environment. Soon, we will open our Certified Service Express, which will offer an under 30 minute Lube, Oil & Filter service and extended hours for your convenience. Bring your vehicle to the experts at Queenston’s Certified Service. 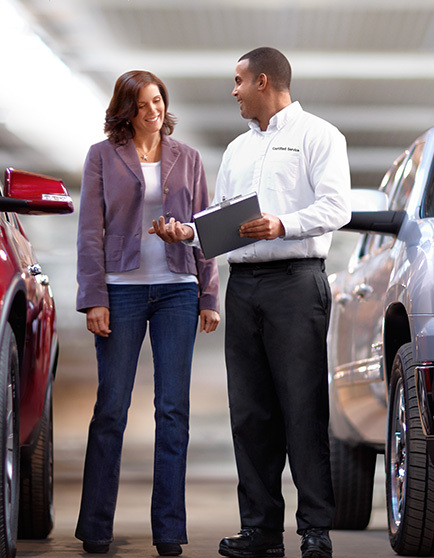 Visit us at www.queenstonchev.com to schedule your service appointment online, 24/7! Internet in your car? It’s here at Queenston. 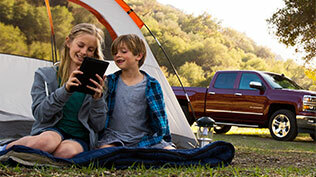 Chevrolet is leading the way with the most vehicles in its line up offering the available built-in OnStar 4G LTE Wi-Fi hotspot, allowing drivers the ability to seamlessly connect their smart devices and vehicles to the Internet. Whenever your vehicle is on, available OnStar 4G LTE Wi-Fi is too. It offers great signal quality and bandwidth for up to 7 devices and provides a better in-vehicle experience than your smartphone. The stronger signal delivers a fast, reliable connection that is automatically on after initial setup and ready to connect to your mobile device. Visit us at www.queenstonchev.com for more information and to view our online inventory of exciting Chevrolet cars, trucks and SUVs. If you’re looking for dependability, General Motors vehicles should be at the top of your list. For the first time, all GM brands ranked in the top 10 in the J.D. 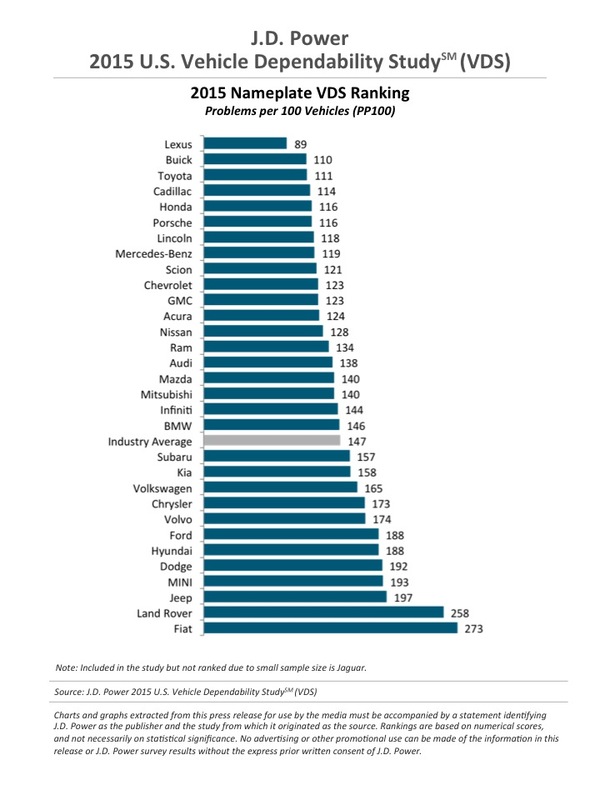 Power Vehicle Dependability Study. This year, in an unprecedented placement, Buick ranked second with Chevrolet and GMC in a tie at tenth. Based on past studies, this is the highest ranking ever for the Chevrolet brand. This year, they led the Midsize Car segment with the Malibu while the Chevrolet Camaro ranked first in the Midsize Sporty Car segment for the third year in a row. “GM’s customer-driven approach to quality and dependability is breaking through…Dependability is a top purchase consideration and key to customer loyalty. These awards reflect our commitment to providing customers with the best overall experience in the industry,” said Grace Lieblein Vice President of Global Quality. At Queenston, we are proud of our award winning models and are excited to show them off. Stop by one of our two locations Queenston on Centennial or Queenston on the Mountain and take your test drive today! We have some very exciting news to share at Queenston on the Mountain! 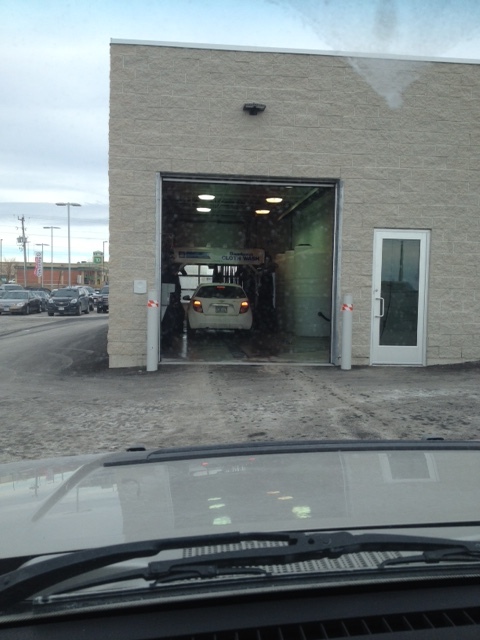 We are happy to announce that we have completed construction on our new state-of-the-art onsite car wash! 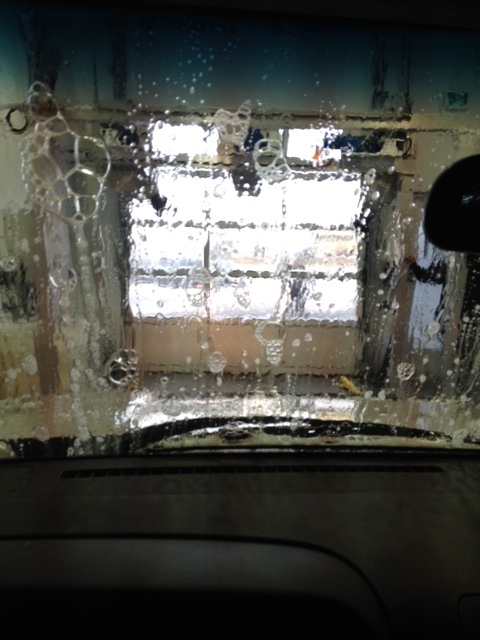 Now, every time you service your vehicle at Queenston on the mountain, you will receive a complimentary wash of your vehicle. Did you know we offer detailing? Please call our appointment coordinators directly at 905-381-4286 or email us at service@queenstonchev.com to schedule your detailing appointment. New Years Resolutions – For You and Your Car! It’s a new year and a new start. You’ve probably already made your own New Year’s resolutions, but what about when it comes to your car? This year, let’s resolve to take better care of our vehicle and be a more conscientious car owner. Rubber floor mats protect your interior from dirt, water, mud, and more. At Queenston Chevrolet Buick GMC and Image Honda, we sell mats that are custom fit to your vehicle. These floor mats not only provide you with the satisfaction of having OEM quality protection, but you won’t have to worry about them slipping underneath your pedals, which can be a serious safety risk. Sliding, slipping, zero traction….the list goes on. Winter tires are critical, especially with our Ontario winters. Not only are they a good investment that give you added safety and peace of mind, but they save you wear and tear on your all-season tires. Swapping them out twice a year gives you added life on your wheels! Our certified technicians at Image Honda and Queenston Chevrolet Buick GMC are trained to know your vehicle inside and out and are able to spot things that you might otherwise have missed. Bringing your car in at least twice a year for regular checkups and preventative maintenance may cost you in the short term, but will save you in repair costs and increase your resale value. I resolve to check for fluid leaks at least once a month. This is always a good idea and one of the easiest things to check for. We recommend taking a pizza box and placing it under your car for the night – in the morning, bring the box into the dealership and show us your art work. We will be able to tell what is leaking based on the colour and where it dripped on the box. This year, don’t use the old excuse that your vehicle isn’t fuel efficient! True, it may not be the best on gas, but there are always ways to improve your fuel efficiency. Watching your speed, maintaining your vehicle, carpooling with people co-workers are all easy ways to save on fuel costs. There really is no reason to leave your car idling – it is bad for the environment, increases your gas consumption and will cost you extra money each year. I resolve to wash and keep my car clean. I make this resolution almost every time I clean out my car. Not only will cleaning your car make it look better, but it will extend the life of your car, protect the paint and increase its resale value. Most importantly, don’t rush! Leave plenty of time if you need to be somewhere at a specific time. If you are running late, evaluate the circumstance – will you really be that late if you don’t make the green light? No one is a perfect driver and there are certainly driving skills we can all work on. Perhaps, you want to learn how to back into a spot or even parallel park. Whatever it is, work on it – you’ll be glad you did. We’ve been bragging about this truck from the beginning, but now we can officially say the 2014 GMC Sierra is the “Best New Pickup” in Canada, voted by the Automobile Journalist Association of Canada (AJAC). The all-new Sierra is the most powerful and technologically advanced truck in GM’s 111-year history. Last October in Niagara Falls, 147 vehicles were tested and evaluated by 80 journalists who voted on the vehicles, combined with objective data. Each journalist drove each categories’ vehicles back-to-back in the same day, under same conditions on closed roads to ensure fairness. We know how great the Sierra is and we encourage you to visit us at Queenston on the Mountain and experience its power and comfort for yourself. Right now, until December 9th, take advantage of our 0% On Everything Event and drive home your new Sierra today! The All-New 2018 Honda Odyssey is Here! Queenston Chevrolet Buick GMC, Chevrolet Dealership Hamilton, Honda Dealership Hamilton, Whether you visit Queenston on the Mountain, Queenston on Centennial or Image Honda, we offer New and Pre-owned Vehicles, Parts & Service Centres and Finance Departments who are ready to help you. If you are in need of a new automobile or parts / service for your current vehicle, AutoHwy.com is here to assist you with any of your automotive needs!